On Wednesday 18th October 2017, a group of 41 students and 5 staff members from Cross and Passion College and Ballycastle High School set off on a collaborative excursion to the historic city of Krakow in Poland. This trip followed on from the highly successful inaugural collaborative break in the same location completed in February 2016. The group flew out from Dublin airport and enjoyed excellent accommodation, just outside the centre of Krakow, at the Hotel Apis. Temperatures around 20 degrees provided a beautiful autumnal backdrop to walking tours of the Old Town centre of Krakow and the Jewish Quarter of Kazimierz. The Polish Royal family have residence at Wawel Castle in the city centre and the pupils and staff enjoyed an informative guided tour of the castle grounds and cathedral. The 13th century salt mines at Wieliczka provided another highlight of the trip and the group marvelled at the many figures, sculptures and exhibits to be found at the amazing subterranean site. 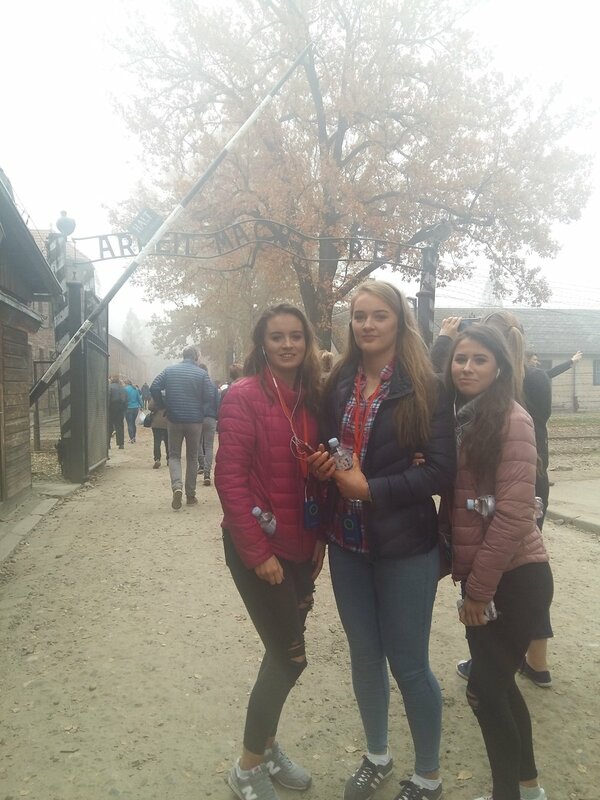 The harrowing and extremely moving experience of visiting the former Nazi concentration camps at Auschwitz and Birkenau will live long in the memory of the teachers and students; a hugely educational tour brought home the realities of the Holocaust and the plight of the Jewish people at the hands of their oppressors. The walk around Auschwitz included a visit to the memorial wall and the cell of St Maximillian Kolbe who gave his life for another prisoner in the camp. 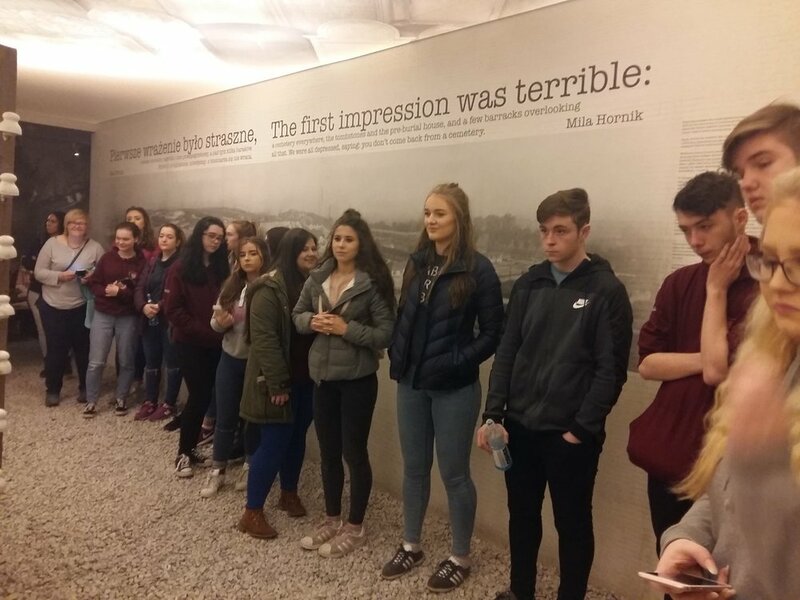 The eerie shell of the former gas chamber also provided a solemn moment for the visitors and the idea of the trip as an opportunity to bring history into focus was obvious here. Back in Krakow there was still a busy itinerary to get through and the two schools were intrigued by a visit to Oskar Schindler’s factory to hear the story of a celebrated hero of the Holocaust. There was also shopping at Krakow’s renowned Galeria Krakowska and a lively evening was spent at the waterpark at Wodny. The activity packed four-day trip was complete after a tour of the Lutheran Church of St Martin’s in the centre of the Old Town square. This was a superbly successful trip furthering the strong bond between the two Ballycastle schools, their students and staff. It is envisaged that trips of this nature will continue to feature and the staff of both schools are extremely grateful to the parents who supported them. Members of staff who accompanied the group from Ballycastle to Krakow and home again were, Miss J Elliott and Miss N Thompson from Ballycastle High School, Mrs S Doherty, Mr P McClean and Mrs G Campbell from Cross and Passion College.